FAILURE TO LAUNCH… What’s Going On?! Today’s post doesn’t explicitly deal with reviews explicitly, but it’s a problem that I’ve been having a lot and it deals with new product launches. 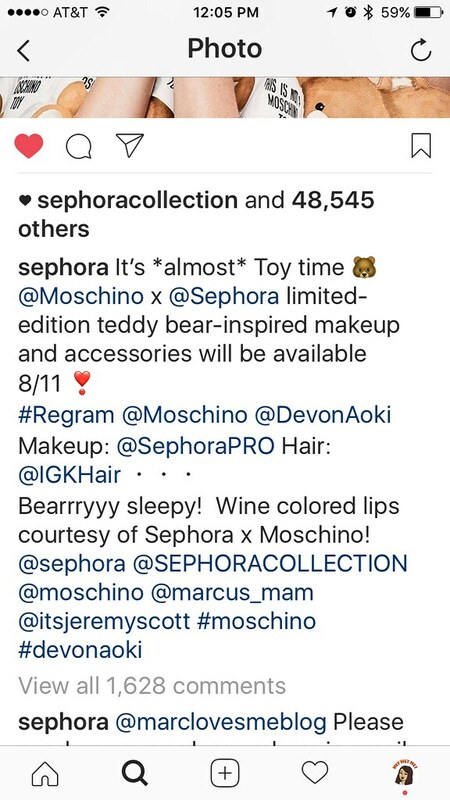 What really set me off was the SephoraxMoschino “launch” that never really happened. As a makeup blogger/reviewer, my goal is to get my hands on products that are new to market, innovative, limited edition, special packaging, etc. I then review it. I don’t get sent anything in terms of PR packages, so I am an everyday consumer. Like most people nowadays I get information regarding launches through social media, mainly Instagram. I follow brands like Sephora, Ulta, Morphe, Ofra, etc. 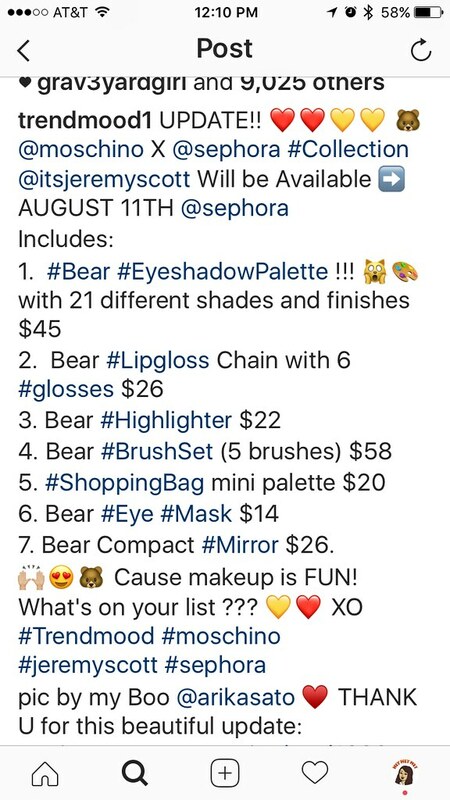 to be up to date, but I also follow folks like DupeThat and TrendMood1 where they have more insight in regards to launches like: date, price points, where to get it, etc. When there is a collection that I truly want to get my hands on and I am legitimately interested in either the packaging or the product itself, I will note down the day and time (if available) of when that product will launch. I even set a reminder on my phone and in my calendars and I prepare the website to add whatever it is to my cart and then check out. That was just the extended version of – I am always prepared for a launch. Here’s my biggest gripe with these launches and the way they are handled. If you are a company that is in-tune with the roll social media plays in consumer’s purchases, wouldn’t you keep an eye out on the amount of excitement/buzz going on around the launch? Wouldn’t you keep tabs on the numbers or at least use the numbers to try to ballpark how much inventory you will need? I understand that some stores like MAC wouldn’t carry a huge stock because they will stock the stores too, but in today’s world, whoever has it first and gets to put up the images/videos first are the ones who will be getting the views. During MAC’s Mariah Carey launch I woke up before the products went on sale; I had my laptop, iPad, and phone ready to go – there was only 1 product that I wanted. At the exact time the products launched, I put the item I wanted in my shopping cart and when I tried to checkout on all three devices, it said that it was sold out. I was frustrated and upset because I had everything ready to go, but they provided an update when to expect the items in stores. I went to my local MAC store a couple weeks later and they had the item that I wanted in stock and it’s not like I took the last one. However, their Selena launch went very differently – much like the Mariah Carey launch, I prepped myself. I had my iPad, computer, and phone going with the browser on and on my computer, I even had my Twitter pulled up to MAC’s page just so I can see the flow and when it actually launched. Much like the Mariah Carey launch, I put what I wanted in my cart and tried to check out and of course I ran into the “one or more items in your cart is no longer available.” I took a look and both lipsticks that I wanted were sold out. Sad face for me. I knew that this launch, once it hit stores, would definitely sell out because I know the fan-base for Selena is still so big. I work at a mall and when I walked past MAC the day that it was brought into stores, they need to borrow 6 stanchions to keep everyone in line and there were so many people that they would only allow 3-5 people in at one time and they could each pick up a maximum amount of products. I eventually was able to get my hands on the two lipsticks that I wanted and now the products are available at my local CCO (Cosmetic Company Outlet). I personally like the way MAC does their launches because I know that even though it’s sold out online, I have a high chance of finding the products in stores and they do an excellent job at communicating when certain products will be available in stores. They also seem pretty responsive in regards to answering questions regarding launches and providing information as to who to contact for more information. 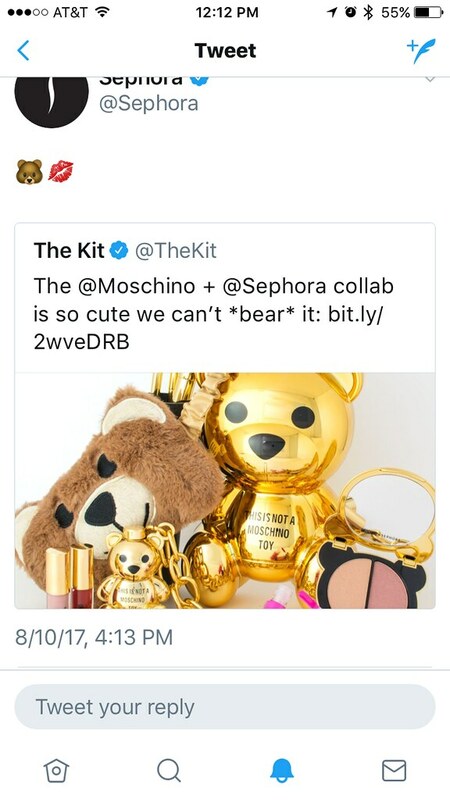 When Sephora first announced their collab with Moschino, I knew it would be something that everyone would want to get their hands on – I mean it’s a freakin teddy bear collection and it’s so cute that a part of me died from the cuteness! The original date that the collection was supposed to launch was August 11th. Sephora didn’t really talk about it, but posted one picture prior to the launch. 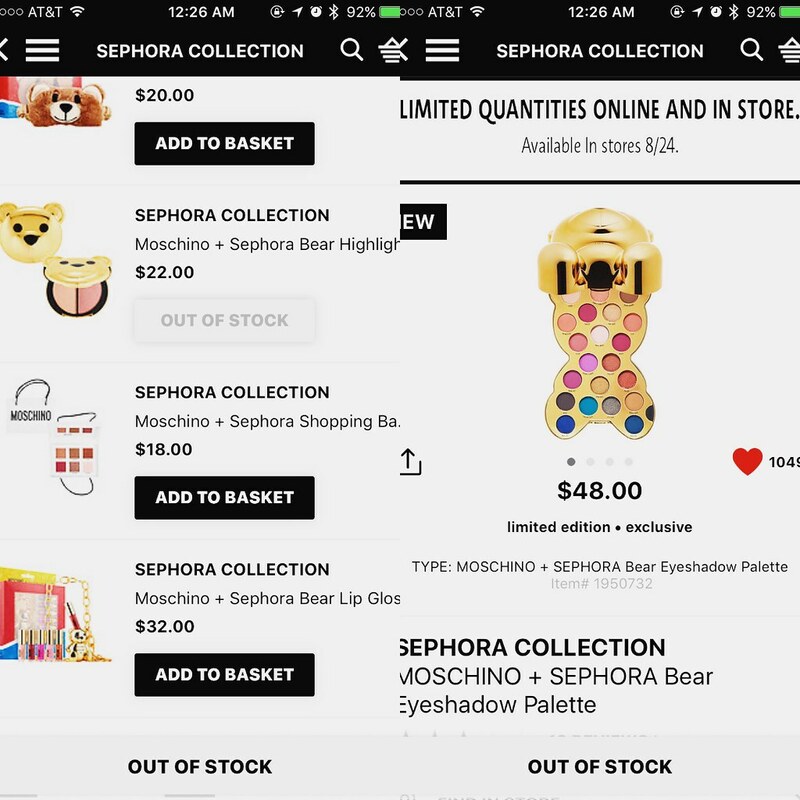 The day of the launch all hell broke loose – I, like many other, flooded Sephora’s website just waiting for the collection to drop. I signed up for the email notifications so I would be notified when the products that I wanted were available for purchase. I waited from 5:00AM to about 1:45PM for this collection to launch, and I kept refreshing all of Sephora’s social media accounts, but nothing was posted or mentioned. It took a bit of digging to find out that “the bears are running late,” and the collections wasn’t going to launch until the following week. Finally around 3:00PM (pst) Sephora had finally posted something about the collection. I felt bad for those who were up since midnight waiting for the collection to launch. They announced that the collection will be available on August 18th, and yet again NO TIME announced. Fast forward to 12:28AM on August 18th – I woke up in the middle of the night to use the potty, and decided that since I’m up, I might as well check my app. To my surprise the items had launched and the two items that I wanted were already sold out. The collection will be in stores on August 24th, but again with limited supplies. Again, I checked all of Sephora’s social media and there was nothing posted. I check my email because I know I had signed up to receive the notification and I got nothing in my email. I went to bed upset, frustrated, and just mad that I missed out on something that I had saved up for. My problem with these makeup launches is either a failure to communicate and not enough stock. Even if an item is “Limited Edition” a company always seems to restock eventually, but by then it’s too late. The hype is over and everybody has moved on. Their either discouraged that they didn’t get their hands on it first (and were able to post about it) or they just don’t care anymore. Also, the communication with brands and information on the collection drives me absolutely crazy. I hate when brands don’t: A. address the specific date and time that the collection launches, B. announce that the products are available online, C. have it easily available on the home page, D. announce if a collection’s launch is delayed. I just wanted to rant about all these collections dropping and how they are done. I’m just beyond frustrated with this collection launch. I know it’s silly to be upset over something so small and that there are bigger things to be upset over (trust me, I am upset with what has been going on in this world), but this has been an issue that has been building up and I’m just at the end of it. As a makeup blogger, it makes it extremely difficult to do what I love when I don’t have access to what I love. What are your thoughts on these failed makeup launches? Let me know in the comments down below! You can also see more screenshots of my frustration on Twitter and Instagram @ciaociao808.